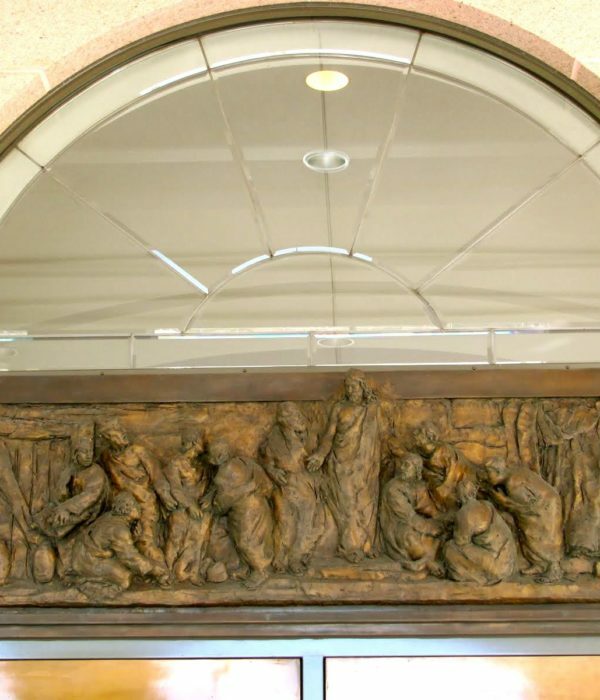 This bronze relief sculpture of Christ appearing to ten of the apostles in the upper room was created for the front of the Church of Jesus Christ of Latter-day Saints’ temple in Newport Beach, California. Because of the lengthy approval process, it took 4 years from the time of the first concept meeting to the time it was finally installed. The project was challenging, rewarding and memorable. To sculpt this piece, I had to keep in mind where it was going, and how it had to keep in harmony with the overall building. Having studied relief sculpture, I remember in a book on sculpture by Lanteri, where he talks about how one must be careful in relief sculpture not to create too many shadows, or have too much depth to the piece or it can compromise the structural integrity of the building, from a visual point of view. In otherwords, it you have too many recesses and deep perspectives that make it look like things are running off into the distance, it will look like the building has a hole or holes in it. Renaissance buildings that have too many decorations and deep perspective reliefs can make it look like the wall is ready to fall over! So in sculpting this relief, I kept it simple with not much depth at all, some shadows, but not too many. At the same time, there had to be some shadows otherwise the figures would not be distinguishable with so much light bouncing around. I sculpted the piece in a room with an 8 foot ceiling. Because of this I placed the sculpture high up so I would have to step on a box or two to work on it. I would then get down low on the ground and look up at it. This is how it would be seen, looking up, or from a distance. Looking at it level, close up, is not how it is meant to be viewed. When I sculpted the piece, I kept all these things in mind, knowing that too much detail, too much depth, was not what was called for. When I look at it close up, I think, ah, why did I do it like that? But when viewed from down below, in the setting it was meant for, or from a distance, it looks great! Without a doubt I hoped and prayed for as much inspiration as possible. While sculpting, the main thing I had in mind was to be as sincere as possible, and to create it the way I felt it should be, and to drown out any doubts. 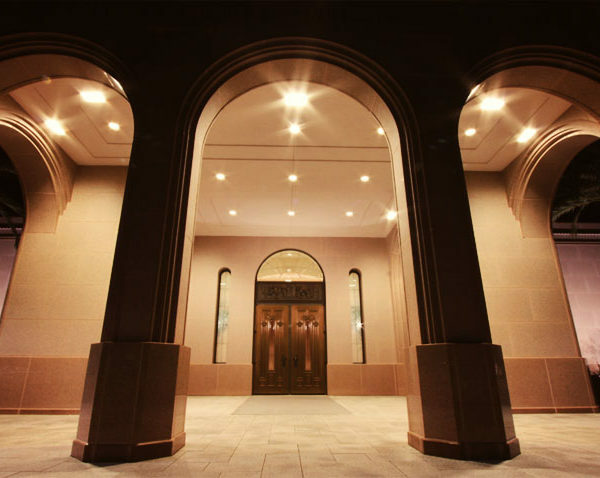 Once the piece was finished in clay, it would need to have one final approval by a committee made up of three men, the first presidency of the LDS church. Would they like what I did? In the end there was one small change made to the cloth to the right of the frieze, and the sculpture was approved. With time, the sculpture is darkening and becoming a more even patina. I think it looks better now then it did when I first installed it. 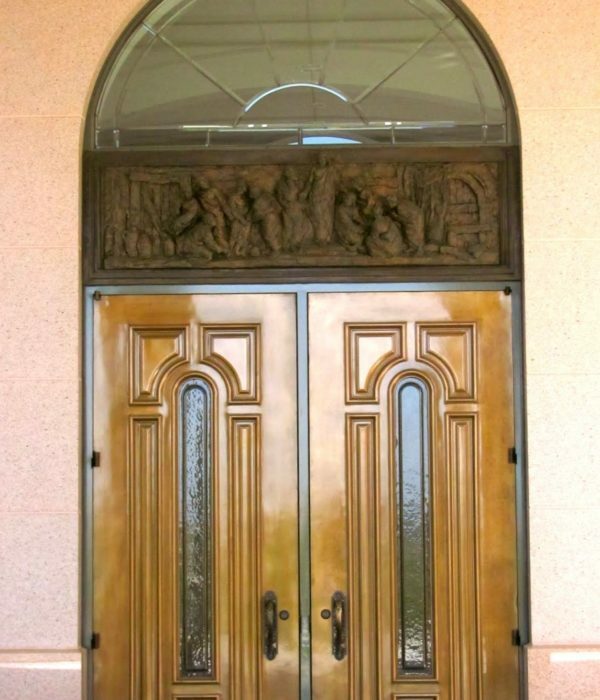 They also changed the doors to a more decorative design which compliments the sculpture very well.